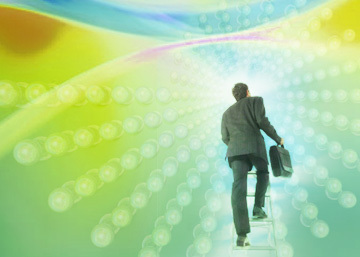 The Ladder of Motivation | Fourth Dimension Inc. The motivational thinking can be broadly classified into two categories: ego-driven and ego-transcending motivation. This article is an attempt to arrive at an evolutionary synthesis on motivation which places human motives in an ascending spectrum. The basic assumption of modern motivational theories is that human nature or the ego is an obstinate seeker of rewards. The task of motivation is to pamper the ego with rewards for desirable behaviour or performance and threaten it with disincentives for unwanted behaviour and performance. This assumption is to a large extent valid for the ego in our lower nature, which needs a constant dose of stimulating recognition to remain motivated. It is now recognized that money or monetary rewards no longer satisfies when the basic material needs and luxuries of the individual are fulfilled. But when the desire for money ceases to be the motivator it takes higher forms in the social and psychological level like for example, the desire for power, prestige, position, authority, status, career advancement or at least a sheer recognition in the form of a word of appreciation, a pat, or a smile or some form of fondling of the child of vanity in us! But, as Sri Aurobindo points out “ego is the helper and ego is the bar”. So modern motivational theories are valid for those who are in that stage of evolution where ego is the helper in their evolutionary progress. At present, the number of people in this stage of development may be very large or even a majority. But there are already a growing number of people who are seeking for an inner moral and spiritual fulfilment in work and their number is likely to increase and multiply with the rapid spiritual awakening of humanity in the future. And for this growing group of seekers of inner fulfilment, modern motivational theories and practices based on ego may not be entirely effective. Because many of them may be in a higher stage of development when ego is not a helper but an obstacle to their further development. This higher level of inner fulfilment comes not by nurturing the ego and remaining within its narrow confines but by rising beyond the ego into the vastness of a higher and a more universal consciousness. But how or in what way this ego-transcending motivation is superior to the ego-driven motivation? In the Indian spiritual perspective, the true self of a human being or the true individual is not the ego but a universal, eternal and unconditioned being, consciousness, and energy with an inherent and eternal delight in it. Ego is only a temporary and conditioned formation which limits, confines and veils the true self of the individual and prevents it from coming into contact with his higher potentialities. The ego limits the consciousness, creative energy and the inherent delight of our being. So loss of ego means, in proportion to the loss, expansion of our being and consciousness and as a result increases of understanding, energy, sympathy and delight of being. And when there is a total annihilation of ego, our consciousness, is projected into the infinite and universal consciousness of our highest self. But this applies only to those who are in the higher levels of development with a well-developed and individualized ego. For those who are in the lower stages of evolution with a weak and underdeveloped ego, if they try to prematurely dissolve their ego, they may sink into the subconscious instead of raising to the super-conscious. For we have to first develop our ego and raise it to a certain level of self-consciousness before it can be safely dismantled into higher levels of consciousness beyond ego. Thus there are four stages in the motivation spectrum. First is the ego-driven motivation through external rewards; second, self-motivation through taking joy in work; third, ethical motivation through self-dedication to a mental, moral and social ideal. Fourth, spiritual motivation through elimination of ego and desire.